Yes, I want to tell you about this very good, very simple frittata I made for brunch on Sunday. It uses those incredible leeks and it was delicate and delicious in a ladies-who-lunch kind of way. It could probably be made more substantial with extra eggs, milk, and cheese – but our guests liked it just the way it was. This morning I have been dreaming about putting it on a ciabatta roll slathered with aioli and topped with thin slices of tomato and peppery arugula. For breakfast. Or lunch, or dinner. Or all three. Seeing as it is a winner, I will most definitely share the recipe but first I have an important question to ask. Anyway, my tattoo is sideways (the guy made a mistake) but I have loved having it. I feel like I have a special secret and I love those few months in Seattle when I can wear things that make it visible. Now I feel like I am ready for something more out there, something that I can show on a daily basis. For the past year or so, I have thought about getting something on my left forearm but haven’t been able to come up with the right thing. I want something pretty and feminine – something that would look right with a short-sleeved shirt and jeans, and something that would look right with the amazing dress I will wear to celebrate my 40th birthday. I had dinner with a friend recently who has a gorgeous spoon on her upper arm. She is a chef and it is the perfect thing for her. I love the idea of doing something related to food but I want something more feminine – more girlie. I was telling Randy about it and he said, “Why don’t you get some kind of herb?”. And then it hit me. Chives. We have a gorgeous chive plant in our front yard. It is the first of our plants to bloom and it produces all spring and summer. I love the long green stem and the delicate yet substantial purple blossom. I love purple. I love purple and green together. I love herbs and I love chives and, of course, I love to cook. Doesn’t this seem like a natural fit? It’s pretty, it relates to my life in food…I feel like it’s me. So – here is where you come in. Am I crazy? Would this look beautiful or just weird? Will I love it in 20 years or regret it? This is, obviously, a big decision, and I am definitely looking for feedback, so tell me. What do you think? In the meantime, while you are pondering, make this frittata. Delicate, lovely, delicious. Preheat the oven to 375ºF. Spray a 9-inch pie plate with non-stick spray (or lightly coat it with oil). Melt the butter in a large skillet over medium-low heat. Add the leeks along with the salt and stir to coat. Add the thyme and cook until starting to soften, about 4 minutes. Add the water and reduce heat to low. Cover the skillet and cook, stirring occasionally, until the leeks are meltingly tender, about 25 minutes. If there is still liquid in the skillet, remove the top and allow it to cook off. Remove from heat and set aside to cool for a few minutes. Crack all of the eggs into a medium mixing bowl and give them a good whisk. Add the milk and whisk again. Add the leeks and mix together, then add half the goat cheese and stir carefully. Pour the egg mixture into the pie plate and crumble the remaining goat cheese over top. Place in the oven and allow to bake until the middle is set, and the edges are only very light brown, about 20 minutes. Remove from the oven and allow to sit for 5 minutes before serving. Can be eaten warm or at room temperature. Or cold from the refrigerator the next day. I don’t think it’s weird to want another one. I think an herb is a great idea. DO IT! I have been thinking more and more about a tat myself.. a little drawing of wife and son, and perhaps a pig and salmon.. You should totally do it – I love the idea of a chive. and not chives, but i love this beautiful herb artwork! The fritatta looks so delicious, and I love how you added the single flower on the top and it transforms the look of the dish and the wonderful photo! I love the idea of the chive tattoo. Sounds like it will always be “you.” And even if it’s not… there’s something kind of neat about how tattoos are a bit of a “time stamp” of a place and time in your life, and how they will always remind you of that. I’m not really someone to give advice on this since I am super wary of tatoos (I always think, is this really going to look good on a saggy 85 year old?). I regret all my youthful piercings beyond the one ear hole. But that being said, you’re obviously a tattoo person and if you’re sure you want one then I think a chive would be lovely. They’re very pretty! I actually really like the chive idea (doesn’t hurt that they are one of my favorite herbs!). The flower is so pretty and definite gives off a sense of femininity but the chive itself is a pretty strong flavorer and something that is basically universally loved (even my herb-hating father really likes chives). I would say. Do it. And I will definitely be making that frittata. 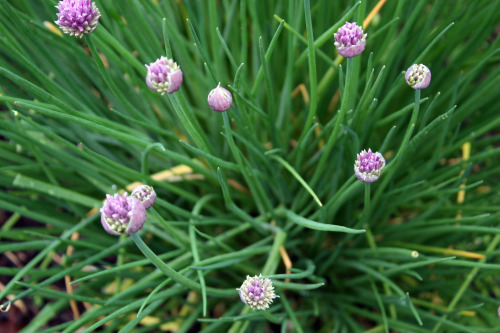 I think chives are a really cool idea for a food-related tattoo. But, I think if you’re not careful it could end up just looking like grass, and then you’d spend the next 40 years with people constantly asking why you have grass tattooed on your arm. I have been trying to decide on my first tattoo for a long time now, and I still haven’t come up with anything that I think I’ll still like when I’m 40! Glad you’re enjoying yours. Ok, I am not a tatoo person, but my sister (who is 62 years old) loves them and had a new one made just a few months ago, so who cares about age? :-) Hers are all very discreet and with an Oriental flair (for instance and yin yang sign on the left ankle). I like the idea of a chive for your tatoo. My chives in the garden are at the same exact stage as yours, this morning I was admiring their color, so beautiful! Hope you will find a nice design, please keep us posted! I applaud you for putting some thought into it. If you are going to get something permanently inked onto your body it should mean something to you. I know so many people who show up at a tattoo parlor and just pick some random design off the wall. I agree with some of the other comments. You will want to make sure it is a really good rendition of chives or some people might not know what it is. Yes, go for it. I think it’s it will be beautiful and personal and a bit girlie. I don’t have a tatoo but reading your post almost made me want one:)! And I’m teaching a leek frittata with goat cheese in my cooking class on Saturday! I haven’t ever commented before, but this post has brought me out of hiding! First, I want to tell you how much I love your blog. As for the tattoo, I agree with the other comments about making sure you get a great rendition of chives. Go for it! You have obviously thought it through so as not to be a rash decision (and if it were, it would still be perfect reminder of a place an time in your life). Chives are perfect! i think you should go with it. As long as the artist is sure to make it look like a chive, I think it would be meaningful for you (the only reason i think ppl should get tattoos anyways). At this point, I don’t think you are going to fall out of love with cooking. Can’t wait to see it! I made this leek frittata last weekend for brunch, as you know. I was just staring at my gorgeous chive flowers in the garden and I read this post. I dislike tatoos on women immensely, however, who cares what I think. I think everyone will ask “what is that”? if you do the chive. So…..how about a whisk or a wooden spoon? I guess I am the only commenter/friend who disagrees/disapproves. As soon as I began to read the question, I was thinking ‘some kind of herb.’ I think, a small, delicate image would be something you’d like for a long time. And, delicious frittata! I don’t have a tattoo, but I’ve always thought if I got one it would be a kitchen utencil or food related thing. Chef Duff (Ace of Cakes) has a flaming whisk tattoo. I’ve always thought that was the coolest. Good luck! Sounds wonderful! Youre recipes and pictures are so nice. As far as the tatoo goes… do it(or not) for yourself chica!Who cares about what the rest of us think. Maybe when it feels right, you will know. Love this frittata! You taught it in a cooking class a long time ago, and I’ve made it countless times now and it’s always a winner. I love the idea of chives. The colors are so pretty and I’m sure you will find a design and artist that will do it justice. Where are you going to go? I hear Slave to the Needle is great. You just might inspire me to get my little something somewhere:) Fun post, can’t wait to see what you come up with! I wish I could see a picture of what you’d like your tattoo to look like – I’m having a hard time imagining chives in tattoo form! Still, I like the idea of a dainty flower, so I vote yes for a chive tattoo. It’s original, and sounds like you’ll choose something classic-looking. I love your idea, AND how you’re striving to make it meaningful. Regarding tattoos, as a designer I have 1 super big pet peeve: when people have multiple tattoos that aren’t cohesive. Not quite as much of a problem when your body is one entire giant tattoo, but I think that if you’re only going to have 2 or 3 or 4, or even 10… think of your body as a whole and make sure the tattoos go together. For example, I have 2 and one has a type face, so when getting my second one I made sure it had the same look and feel to both the design and typeface. This might have exposed my inner-design-geek (hope so!!!) but I’m just saying, there’s nothing wrong with tattoos but make sure to honour your body canvas by making sure it’s beautiful, you love it and it goes with past and future tattoos. ps. i also think that tattoos at times earn the right to not make complete sense… for example, my friend and I got a friendship tattoo that is apparently a symbol that some lady claims an angel communicated to her through a zibu language. bottom line: it’s pretty and we love it! I love that you will be getting a second tattoo. I don’t have one but I love the idea of one that is meaningful and special. My friend has a her whole sleeve done in the most beautiful poppies – it’s only half coloured but I love it regardless. I think chives would be lovely! As for how they look when your skin starts to sag, I think it looks amazing. As a kid I would always love looking at our elderly neighbour’s tattoos (he was in the navy) and I just thought it was so cool. Yay! 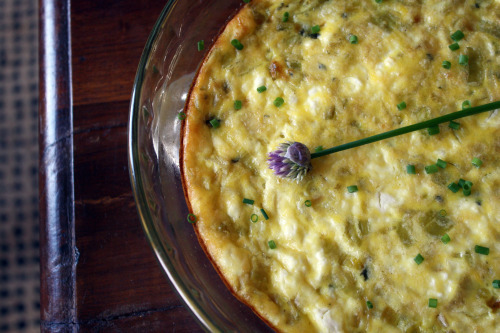 I love the single chive blossom on the fritata and i think it will look gorgeous on you. Hey D! Finally got a moment to check-in on your blog and saw that you’re still pondering the tattoo idea. I love it! LOTS of good comments and ‘food for thought’ in your comment thread – a lot of which I agree with. The only thing I would add is to go into the process slow when you do decide to start – plan to collaborate with a tattoo artist on a drawing before you start (i.e., don’t plan to do the ink the same day; become familiar and confident with the image on paper, first). I’m probably the last person to get advise on a tattoo because I’m so indecisive! I do really like the idea you have about the chive flower. It’s feminine and delicate, but still has a meaning to you, without being really obvious. I’ve been wanting to make a frittata lately, seems like the perfect transitional meal. Love the leeks in this version! Chives….. I like it. I have a friend that has cherry blossoms twining up her arm and it is so elegant and timeless. I can visualize the chives twining up your arm with sweet little blossoms. I am a massage therapist and I have worked on many a person with tattoos they hate! But the majority of them that don’t like their tats had them done when they were under 30 years old. Every person I know how loves their tats got them when they were adults, over 30. The people who got their tats at 40 or older ADORE their tats. So there you go, you are destined to love your tattoo. Just make sure and pick an artist that you know and love their work. Interview them like you would a doctor or someone that you would have to remodel your house. Make sure and post a picture of it! I just found your blog (love it!) and I’m freaking out. I have a leo sign on the back of my left shoulder that I got when I was 22 and I’m turning 40 this year as well (August). How crazy is that? Unlike you, however, I not only don’t want another one, I want this one off! I totally regret getting mine and having had a smaller one removed on my ankle, I am dreading the pain to have this one removed. It is WAY more painful to remove it then to get it put on so really be sure you want another one! 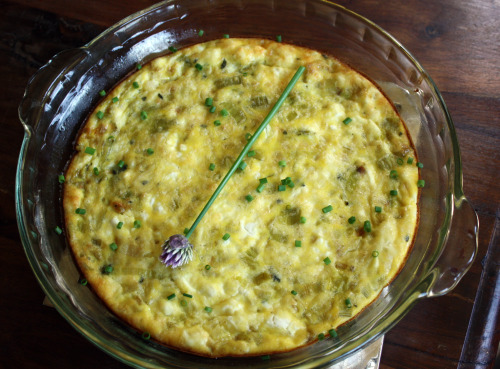 I’m going to be making mother’s day brunch and need to figure out the menu – this frittata looks like it would be a great addition! Good luck choosing your perfect tattoo. Chives sounds like it would be a good one for you!